Mars is in the news. The Americans sent two rovers, Spirit and Opportunity, which landed on Mars a few weeks apart in early 2004, and the European Space Agency sent a probe called Mars Express (which had a lander, Beagle II, with which contact was lost) which went into orbit in late 2003. They join earlier missions such as the Mars Global Surveyor (which I will call MGS from here on out), and Mars Odyssey (just Odyssey from here on out). 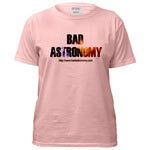 With all this Good Astronomy happening, you just know a lot of Bad will follow. And it has. There have been all sorts of silliness happening from the usual groups, including claims that the Beagle II failed because the U.S. shot it down, aliens on Mars shot it down, aliens on Mars are known by NASA, NASA is covering up alien artifacts, NASA is causing bad weather on Earth, NASA is the devil, etc. Leading the way with this nonsense is none other than Richard C. Hoagland. He is the guy who has been touting the idea that the "Face on Mars" is not just a big hill -- which is what it really is -- but is instead a giant statue surrounded by pyramids, a city, a fortress, etc. You can imagine what I think of these claims, and if you can't, I will gently remind you that the name of this website is Bad Astronomy. I have considered Hoagland to be a fringe pseudoscientist, not really worth debunking. Sometimes, claims are so silly that they aren't worth bothering. But things have changed recently. Hoagland has been given lots of airtime on the late-night "Coast to Coast AM" radio show, which has millions of listeners. His most recent antics involve the new Mars missions. He is claiming that, among other things, NASA is covering up evidence of alien life on Mars. He says the evidence is in the images returned from Mars by the probes, and the "real" data are being hidden from view. These claims, like most conspiracy claims, are silly, internally inconsistent, and pretty easy to show wrong. So you might think no one pays any attention to him, right? If only. He is actually rather notorious in the pseudoscience community. And remember, "Coast to Coast" has an audience of 10 million people. If even a tiny fraction believes in his nuttiness, that still adds up with such a large pool of listeners! Now, I have been on the C2C show several times myself (once to actually debunk one of Hoagland's ridiculous claims), and I am of the opinion that most of the audience listens to the usual crackpots on the program with their tongues firmly planted in their cheeks. But with so many listeners, it's inevitable that many will take Hoagland seriously. And you know what? I've let this fester long enough. This kind of pseudoscience is like a virus. At low levels, it's no big deal, but when it reaches a certain threshold it becomes sickening. I don't think Hoagland has reached the level of, say, the Moon Hoax, but he might someday if ignored. I run a risk here of actually giving him the press he clearly wants so desperately, but it's also a risk to ignore his nonsense, again like the Moon Hoax. And let me be very clear here: Hoagland's claims are insulting. I really don't like it when the devotion and hard work of scientists is unfairly impugned. These scientists are people who are doing what they do because they love it. I get irritated when the subject I love -- astronomy -- is abused, and Hoagland is indeed treating it in an ugly manner. He has the right to say such things (up until it becomes fraud), but I also have the right, and the necessity, to show where he's wrong. A lot of the arguments I make on these pages are gleaned from other people's work. When I have done that, I note it and link to their work where I can. If I am quoting from Hoagland's website I use a black background with white letters, to distinguish it from other sources. I'll note that in these pages, there are bound to be some errors I have made. Maybe a date is wrong, or a small fact is in error, or some such thing like that. There was a lot of writing and research I had to do for these pages, so some mistakes are bound to creep in. When they do, I'll correct them, note that I have corrected an error on the page, and move on. That's one of the big differences between science and pseudoscience: science learns from its mistakes, and gets stronger. That's why it's the best way of thinking we've got going. Let me add this, because it's pertinent: years ago, when I wrote my page debunking the Moon Hoax, Hoagland wrote his own page. Amazingly, to me, he also debunked the Hoax, saying the Apollo landings were real! In fact, his debunking is quite excellent and thorough, and, I'll point out, even corrected a mistake I had on my own Moon Hoax page! Since he appears to hate NASA so much, and has stretched the truth in the past, his debunking was shocking to me. But then I realized why: he claims that alien bases exist on the Moon, and uses NASA imagery to "prove" it. So he was really stuck: he had to support NASA on his page, because if he said the Moon landings were faked, how would he have those pictures he'd been touting? The irony of that situation is delicious to me. One of NASA's biggest detractors, forced by his own nonsense into supporting them. The point to remember about this, though, is that when it suits him, he is capable of doing credible research. So why does he make such outrageous, clearly silly claims? Well, you can make up your own mind about that. The table of contents at the top of every page will help you navigate these murky waters. As time goes on, I will add new pages. There are existing claims by Hoagland I haven't tackled, and no doubt he will squeeze out more pseudoscientific claptrap as time goes by. Like Bart Sibrel, Nancy Lieder, and all the others, Hoagland will probably never run out of nonsense to peddle.